The new Dupont Circle restaurant Agora (1527 17th Street, NW), which opened in May 2010, is working on being green from the ground up. 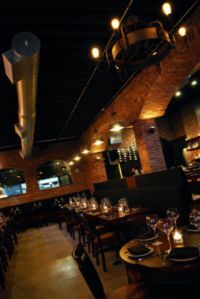 Most of the restaurant’s materials are recycled or reclaimed and the cement flooring and exposed brick walls are natural conductors of heat and cold. Agora’s Mediterranean organic and biodynamic wines are kept in a naturally controlled temperature wine room with recycled wood racks and are even served in glassware made from recycled cork and glass. – An in-house water filtration provides still or sparkling water. – All bottles, paper, and plastic are recycled. Agora, which means “gathering place” in Greek brings authentic Turkish cuisine to the heart of Dupont with a variety of Mediterranean mezes. The bar also offers six different types of anise-flavored raki, as well as cocktails that highlight Turkish ingredients, such as one that uses Turkish figs.